When does Street Photography become Documentary or Reportage photography ? Never ? That would have been my answer until recently but recent events have made me question everything that I ever thought I knew about anything ! Let me explain , I have invested more time than I should have, trying to create a creative personal photographic record of my everyday life in Britain during the Brexit years . The State Of Britain project touches on the uncertainty, nationalism and politics growing out of the Tory governments policies of austerity & the EU referendum . Many of the Street scenes & people pictures within the series could be described as having a firm foot in the documentary photography tradition but I don’t really want to trouble readers with a definition argument here , the surprise for me has been how many of the unequivocal Street pictures appear to reflect the “crazy” mood within the UK during these “turbulent” times ! 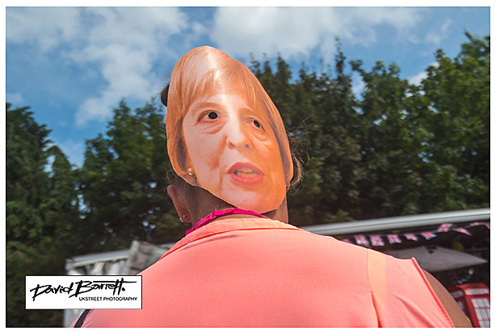 At the time of capture I thought that the images below were a bit of a stretch for a serious photographic project aiming to represent the changes of this country during the Brexit years . With the benefit of hindsight I wonder if these “unusual” Street Photography candid captures are more representative of my country than many of the more traditional images ? I am beginning to wonder if modern photographers might be better served by introducing a more interpretive approach to the real life historical events they shoot, I believe the younger tech aware audience for contemporary editorial photography is becoming more sophisticated & media savvy. They enjoy reading into the symbolism, iconography and metaphors within our photographic works ! Dare I suggest that a deeper engagement with the political narratives of the day by Street Photographers might lead editors to use photography in new less descriptive ways ? Showing how something looks is not enough anymore, bring more of yourself to the party ! Form a partnership with the viewer , leave room for interpretation ! Don’t worry I’m not suggesting Street Photography is in danger of going mainstream any time soon as the gatekeepers only commission established documentary photographers for serious stories , Street Togs are a bit too lightweight , aren’t they ? Until next time, keep it real ! Ah, the answer to the question at the top of this piece is , when the money’s right !